8% Off Select Bookings at Hotels.com Save 8% off selected bookings at Hotels.com. 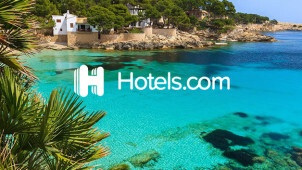 Up to 40% Off Summer Hotels at Hotels.com See the sun for less with up to 40% off hotel destinations across the globe at Hotels.com. Extra 10% Student Discount at Hotels.com Don't miss out on great adventures, shop online at Hotels.com and save with your Student Beans ID! Up to 50% Off with Deal of the Day at Hotels.com Bad day? Nothing will cheer you up like booking an incredible holiday! With the Hotels.com Deal of the Day, you can save up to 50% on destinations across the world. Last Minute Package Deals from £96 at Hotels.com You could leave this week! Take advantage of the amazing last minute package deals and getaway for as little at £96 at Hotels.com. Up to 40% Off Beach Escapes at Hotels.com Head to the beach this summer and save with Hotels.com, with up to 40% off selected seaside hotels. Orlando Hilton Hotels from £93 at Hotels.com Whether you're coming to see the Mouse, the sites or family you can stay from as low as £93 at Hilton Hotels at Hotels.com. Up to 50% Off Selected City Hotels at Hotels.com We all need something to look forward too! Why not book a quick city break to fit in around your busy schedule, and save up to 50% with Hotels.com. Up to 50% Off Selected Miami Beach Hotels at Hotels.com Welcome to Miami. We have up to 50% off hotel bookings in the Miami Sunshine Sale at Hotels.com. Booking your holiday accommodation with Hotels.com is a great way to save money on hotels, luxury villas, apartments and independent B&Bs in locations all over the world. Hotels.com have over 250,000 hotels to choose from, all with great deals to make your getaway more affordable. Whether it’s a weekend escape, long haul trip, city excursion, indulgent beach break or quick business trip, you’ll pay some of the lowest hotel prices around with vouchercloud. By continuously searching for you, Hotels.com are able to secure the lowest prices on hotels, apartments and self-catering accommodation in the most sought after locations around the world. If you’re at a bit of a loss about things to do on your holiday, check out Hotels.com extensive range of travel guides, with hot tips on things to do and their pick of the best hotels for a variety of budgets. Whether you're looking for the lowdown on where to stay in Melbourne, a neighbourhood guide to Singapore or looking for the coolest and quirkiest boutique stays in a UK city, Hotels.com have got your travel planning covered. From Spain and Portugal to Las Vegas, winter wonderlands to a place in the sun and romantic spa getaways you'll find exactly what you are looking for at a price that suits you. Click Apply and see your booking total drop! Choose Hotels.com to book all of your holiday accommodation and save with the welcome rewards scheme. When you’ve stayed 10 nights in participating hotels, Hotels.com will give you your next night for free! Sign up here and Hotels.com will tally up your nights every time you book online, giving you the 11th night for free- you just have to pay any booking fees and taxes for the stay. Find out more here! Available to download free on iOS and Android, the Hotel.com app puts booking right at your fingertips. Find hotels, book hotels and access your reservations for an easy check-in. You could even benefit from secret prices; up to 50% discounts only available on the app. The Hotels.com Price Guarantee will make sure you always pay the lowest price for your room. If you think you’ve found a better price somewhere else, double check your eligibility online here, to see if you could claim a saving to pay the cheapest price! Call: 020 3024 8216 or use the Hotels.com Customer Service Portal. Acting as a backdrop to some of the biggest blockbusters, a selection of hotels have become almost as famous as the films that they feature in. For the big film lovers out there, you can bed down in an array of hotels around the globe that will put you in the very scene of your favourite flick. Enjoy five-star luxury in Japan, an often celeb-studded castle in LA or maybe a luxury seaside getaway in England. Take a look at these 10 famous movie hotels where you can re-enact some of your favourite big-screen moments and stay in some rather iconic surroundings. So if you fancy sipping on some whisky in the Lost in Translation bar or slipping on your dancing shoes at the resort from Dirty Dancing then take a look below - you can make these dreams a reality, from as little as £80 a night. Please click the images below to open up a larger version. For our friends dear friends across the pond, you can find all the info in dollars here. If our list inspires you to make a silver-screen trip of your own, make sure to try one of our Hotels.com discount codes which can help you make a saving on your stay! Find the cheapest hotel prices in locations around the world with Hotels.com! You can check the pricing, availability and facilities of over 290,000 hotels worldwide – and get help finding a place to stay for less with a Hotels.com discount code from vouchercloud. With a little helping hand from us, you’re guaranteed not to break the bank on your dream trip away, this year and the next! Hotels.com offers a group booking service, designed to make straightforward travel arrangements for your large group. Call their experienced team of travel experts to receive competitive quotes for your wedding party, sports team or social group, and you could save money on room rates and benefit from a stress-free trip. Hotels.com have a stellar selection of rooms at fabulous low prices for your trip to the Big Apple - just use a Hotels.com voucher code to get the best deal. Compare the prices of top New York hotels online, with impartial reviews on Tripadvisor ready to help you make an informed decision. Whether you're looking to catch a show on Broadway or climb the 354 steps to the Statue of Liberty's crown, you'll need somewhere to get a good rest to make the most of your stay. Step out into the big city lights, with New York rooms at Hotels.com prices.